Explore the "petrified" river valley of Deception Valley in the Kalahari Desert where sporadic summer rains attract a plethora of wildlife; the green islands and clear waterways of the Okavango followed by the diverse and wildlife-rich Linyanti and Chobe River systems. The journey ends at the famous Victoria Falls. Group size: Guaranteed from 2 guests; 7 guests maximum. 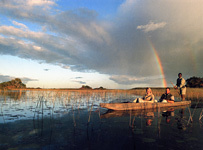 This Exploration reveals the life-filled summer season of Botswana, in prime areas where few people travel. You will experience a nostalgic camping/lodge safari that recreates the sense of a game-viewing adventure reminiscent of the times of the great African explorers. The Exploration exhibits Botswana's scenic areas: The "petrified" river valley of Deception Valley in the Central Kalahari Game Reserve, the fertile green islands of the Okavango Delta and its crystal-clear waterways to the diverse and wildlife-rich Linyanti and Chobe River systems, ending with the world-famous Victoria Falls on the Zambian side of the Zambezi River. Guides: Explorations are led by highly skilled and qualified professional guides with an incredible passion for the natural regions they work in. Sharing the adventure and guiding you on this journey of discovery combined with their vast knowledge of the natural world, history and culture are their professions and personal hobby. Many of our guides are also skilled photographers and can assist you in taking away amazing wildlife photographs. Your guide will host you for the duration of safari, providing you with a consistent, detailed interpretation that is shaped to your specific interests. • Exceptionally diverse range of activities: game drives, walks, a full-day excursion with lunch, mokoro and motorboat excursions and a boat cruise. 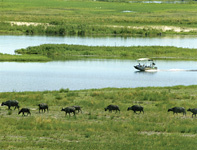 • Exclusive access to the wilderness areas of the Central Kalaharim Okavango Delta, Linyanti/Chobe and Victoria Falls. • Old-style serviced camping as well as accommodation in luxury Wilderness Classic camps. SAFARI COST: $8,056 per person sharing. If a single guest is willing to share and we can match with another guest of the same gender, the single supplement will not be charged. However, if there is no suitable match, the single supplement surcharge will apply. On arrival at Harry Mwanga Nkumbula International Airport in Livingstone, you will be met by a Wilderness Explorations representative and transferred directly to the Victoria Falls for a guided tour before proceeding to Toka Leya. 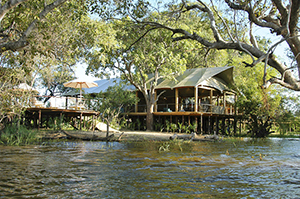 Enjoy great views from camp of the mighty Zambezi River and some of its islands. Deception Valley Adventurer Camp is set in Deception Valley, a prehistoric riverbed flanked by petrified dune lands. The area is very appealing after brief rains, when it is covered with nutritious grasses that attract vast herds from all over the enormous reserve. These large congregations of desert wildlife with their young are followed by opportunistic predators. Allowing for a sublime ‘back to nature’ desert experience, accommodation is in 3 metre x 3 metre (9.84 feet x 9.84 feet) dome tents, complete with mini-verandas. Pure cotton linen (with duvets) on GI stretchers, bedside table with silver lantern and mini luggage benches finish the interior. The bathrooms are en-suite, canvas-wraparound and open-air, with the entrance via a zip door at the rear of tent. In addition to the short-drop toilet, your bathroom sports an old-style tin bucket shower – with hot water available whenever you should require it. There is a separate toilet near the main area available for use during the day. In the main area, evening campfires are the norm, while hurricane lanterns add to the atmosphere. • We have specifically allowed for a 3-night stay to give you to time to relax and unwind as well as enjoy extended day trips to wilderness areas off the beaten track. • Extended wildlife game drives (with picnic lunch) take in the game-rich Piper’s Pans area of the Kalahari, as well as the Letiahau and Deception Valleys. • Predators which can be seen are lion, cheetah, black-backed jackal, bat-eared fox and African wild cat. The rare and seldom seen brown hyaena is also sighted from time to time! • Birdlife is prolific, with over 400 species in the region. Details: Deception Valley Adventurer Camp - includes all meals, activities and local drinks (excluding premium import brands). Overland to Maun and then fly to Gomoti Tented Camp. Gomoti is the Okavango Delta personified, with serene waters flowing through innumerable channels around remote islands and a profusion of plant and animal life. Explore the area by mokoro and motorboat or possibly game drive. Gomoti Tented Camp lies in the centre of the private 6 000-hectare Santawani Concession, in the south-east corner of the Okavango Delta. The camp is nestled under large acacia trees in a diverse game-rich area. Most of the concession area comprises a mixed woodland habitat that gives way to open grasslands which can transform into floodplains in years of plentiful water. Accommodation is in five 5.1 x 3 metre Savannah canvas tents, which are spacious and comfortable, designed to recreate the style of the early explorers, with richly-coloured teak director chairs and comfortable interiors. Separate bedside tables with 12-volt reading lamps, wooden-framed wardrobes, comfortable twin beds and mirrors are provided. A private, en-suite toilet and shower forms part of the structure. Enjoy the midday view from your director chairs, set under the shade of your veranda. Paraffin hurricane lanterns and a crackling campfire set the ambience in the evening, while fresh, sumptuous meals are prepared by your warm Explorations staff and served at a long table in the thatched dining area. An after-dinner digestif may be enjoyed around the fire or taken in the cosy lounge adjacent to the dining area. • Activities focus around day and night game drives and nature walks. • The alluvial sands in these areas are very fertile, resulting in good grass growth, which attracts a multitude of grazing animal species. 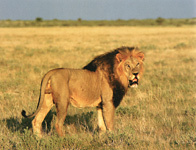 • Wildlife is plentiful and includes leopard, lion, wild dog, cheetah, giraffe, elephant and masses of general game. Details: Gomoti Tented Camp - includes all meals, daily activities, limited laundry and local drinks (excluding premium import brands). Fly to Linyanti Discoverer Camp in the Linyanti Concession. Activities include game drives in the private northern sector of the concession, exploring a range of habitats, which reveal a myriad wildlife en route to slake their thirst from the river. Set in the 125 000-hectare Linyanti Concession bordering Chobe National Park, Linyanti Discoverer Camp is your base from which to explore this enormous wildlife-rich area. Unrivalled in its remoteness and space, the concession is bisected by an ancient watercourse – the now-flowing Savute Channel. Your innovative accommodation is in 6.3 metre x 3.5 metre (20.67 feet x 11.48 feet) walk-in wooden framed canvas sided tents. The tents are airy and designed to recreate the accommodation style of the early explorers, with richly coloured teak director chairs and minimalist interiors. Separate bedside tables with 12-volt reading lamps, canvas and wood wardrobes, bathrobes, comfortable beds and mirrors are provided. Private, en-suite separate toilet and showers form part of the structure. Paraffin hurricane lanterns and a crackling campfire set the ambience in the evening, while fresh, sumptuous meals are usually prepared around a fire by warm and friendly camp staff. • The landscape of the Linyanti is diverse, from floodplains to open dry-land savannah and woodland with sweeping views. • Wildlife includes the seldom-seen sitatunga that can be spotted in the waterways, as well as rare roan and sable antelope, plains game and of course their predators, the lion and leopard – with the endangered wild dog as an incredible bonus. • Activities include game drives in the private northern sector of the concession, exploring a range of habitats, from riverbanks to scrub and forest as well as a full-day excursion with lunch at a remote scenic setting. Details: Linyanti Discoverer Camp - includes all meals, daily activities, limited laundry and local drinks (excluding premium import brands). Fly to Kasane for the Chobe River boat cruise. The area is famous for its unique species such as elephant, puku, hippo and large crocodile. Enjoy a light lunch on the boat. We then take a road transfer to Toka Leya Camp, Livingstone. Set on the western sector of the Mosi-oa-Tunya National Park, Toka Leya Camp perches on the banks of the precipitating Zambezi River. Only 12km upstream from the world-renowned Victoria Falls, the camp is well placed for you to explore the scenic and vibrant region. Limiting our footprint on this pristine land, wooden walkways snake between the 12 spacious en-suite safari-style tents. You will feel safe and comfortable in your tastefully decorated room with an expansive wooden deck looking out at the mighty river – often presenting the sight of rambling elephants, grunting pods of hippo and idle crocodiles. Under a canopy of shady trees, the camp's dining, lounge and bar areas plus infinity pool, offer ample space for you to relax. • Toka Leya has a worm farm and indigenous nursery so as to rehabilitate the plant species of the area. • The densely vegetated islands in front of camp form part of the braided channel of the Zambezi River. • ‘Mosi-oa-Tunya’ is the local name for Victoria Falls, literally meaning ‘the smoke that thunders’ which accurately describes the rising spray that can be seen 30km away. • Activities include Victoria Falls tours, game drives, river cruises, catch-and-release fishing, guided walks and adventure activities. • The park offers good wildlife viewing of buffalo, giraffe, zebra, impala and white rhino. • The prolific bird life includes the African Finfoot, a rarity elsewhere, yet here a resident. Details: Toka Leya Camp - includes all meals, daily activities and local drinks (excluding premium import brands). The grand finale is a guided tour of the Victoria Falls, one of the Seven Natural Wonders of the World. At 1 708 metres (5 604 ft) wide, it is the largest curtain of water in the world. We then bid farewell to our adventure and transfer to Livingstone Airport. Details: Bid farewell to the adventure as we transfer by road to Livingstone Airport (Harry Mwanga Nkumbula International Airport). NOTE: THIS ITINERARY IS AVAILABLE ON FLEXIBLE DATES AND ITINERARIES, FOR TAILOR-MADE SAFARIS FOR SMALL GROUPS UP TO EIGHT GUESTS. This camping safari is guaranteed on a scheduled departure basis with a maximum group size of eight guests and a minimum number of two guests. 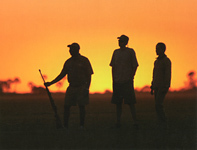 Private and flexible tailor-made safaris are possible, allowing for flexibility on dates, accommodation and itineraries. Suitable for small groups of between four and eight guests, these are also ideal for families. To ensure as much privacy and exclusivity as possible, the areas in which we travel are private concessions in prime locations. All Explorations camps are private and for the use of Exploration guests only, while Xigera, Toka Leya and relevant air or road transfers are shared with other guests. The route we follow is flexible, changing with the seasons to maximize the experience for the guest. Wilderness Explorations also reserves the right to change itineraries due to unusual game concentrations or reasons beyond our control. If there is a change to itinerary, this will be advised as timeously as is possible. To maximise guests’ travel time, a variety of travel modes that bring out the best of each area is used including flying in light aircraft and overland transfers in customised 4X4 safari vehicles. We have specifically allowed for 3-night stays at camps in Botswana; in a journey of this nature, guests have the time to fully relax and unwind, at the same time appreciating an in-depth introduction to the diversity of the area as well as its activities. We will have six to eight camp assistants in addition to the guide at Linyanti Discoverer Camp and 2 camp assistants in addition to the guide at the Deception Valley campsite. Please ensure that full dietary requirements and special occasions are advised at the time of your booking confirmation. Whilst travelling on this safari you will be with other guests doing the same itinerary and some of the camps included on the itinerary are not exclusive to the Exploration hence you will be with other guests who are from different parts of the world and who are of various ages. To get the most out of your safari experience, co-operation and harmony between you and your fellow guests is essential. Children from the age of 12 years are welcome on all scheduled departures, with the prerequisite that all children between the ages of 12 and 17 years share the same tent with a related adult as a safety precaution. For guests with children under 12 years, we can create a private tailor-made safari which is subject to an additional cost. The open vehicles used while camping in Deception Valley are specially designed and extended 4x4 Land Cruisers, seating 8 guests in comfort. All guests have good all-round visibility (although the rear part has a canvas flap that rolls down to lessen the dust entering the vehicle while driving). The large open roof area adds to the visibility and promotes photographic opportunities, and can be closed for seasonal rainy weather en-route. Each vehicle is custom-built to our own standards and includes a fridge and a small field guide book library. Open 4x4 Land Rovers are used at Xigera and Linyanti Discoverer Camp, and are designed so that all guests have all round visibility. At our private Trails campsite situated in Deception Valley, Central Kalahari Game Reserve, our aim is to provide a simple, yet comfortable, serviced camping experience. Dome tents (maximum of two guests per tent) measuring 3 metres x 3 metres (9.84 feet x 9.84 feet), are erected by our camp staff prior to the arrival the guests. They are well ventilated with a mini veranda and individual hand basins for each guest outside their tent. Stretcher beds, bedrolls with crisp linen, duvets and pillows, towels and amenities (soap, shower gel and conditioning shampoo) are provided. In addition, there is a shared bedside table, coir mat (inside) and a 12V reading light. The tents are large enough to stand in and move easily. The bathrooms are en-suite with the entrance to the canvas-wrap open air bathroom (zip door) through the rear of tent. There is a serviced en-suite tin bucket shower – with hot water available whenever guests require it. The bathroom also has an organic compost toilet for each tent, with a separate toilet near the main area available for use during the day. Each bathroom enclosure also has a table with amenities, hurricane lantern, tin basin and a mirror. Hurricane lanterns and a good campfire light up the evening camp. Delicious meals are prepared around our campfire by our safari staff, creating a great atmosphere. The dining area, with dining table, metal director chairs plus bush-style stainless steel place settings and drinks glasses, is under the stars (although we erect a bush dining tent in the event of sporadic rains), adding to the ‘camping wild’ feel. At Linyanti Discoverer Camp, one of our more permanent camps, accommodation is in 6.3 metres x 3.5 metres (20.67 feet x 11.48 feet) walk-in canvas-style tents (maximum of two guests per tent). The tents are airy and beautifully designed to recreate the accommodation of the early explorers – kitted out with separate bedside tables and 12V reading lamps, wooden wardrobes, comfortable beds, flushing toilets and mirrors. Camp amenities (conditioning shampoo, soap, shower gel and body lotion) are provided while private, en-suite separate toilet and shower areas are part of the main tent structure. Discoverer camps are specifically outfitted with comfortable interiors yet aim to bring the guest closer to nature, by means of a lively camp fire, around which meals are often prepared, and hurricane lanterns. Wide-ranging activities and a warm atmosphere complimenting the comfort and added luxury of the camp visited, creating a memorable wilderness experience. Our safaris are all conducted in English. It is a requirement that all participants on the safari have a basic knowledge of English and are able to communicate in that language, primarily due to safety factors. On bilingual hosted departures, English is still the guides’ home language. The foreign language service is free of charge, however, fluency is not guaranteed. On all private tours, we can arrange for non-English speaking guides, subject to availability and at an additional cost. The safari and services of the guide start on our Day 1 as per the brochure and detailed itinerary, so all scheduled commercial flights booked must coincide with the start and end point of the particular Exploration that you have booked. 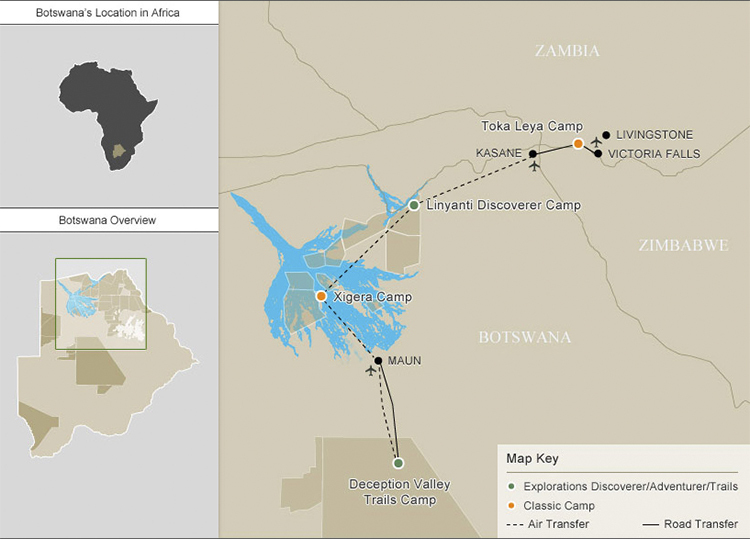 Exploration starts at Maun Airport and ends at Livingstone Airport. If arrival is planned for the day of the safari’s departure, please ensure that this arrival is with the earliest possible flight into Maun. It is important that all guests are ready to depart with the guide by no later than ±13:30. Arrival on a later flight may necessitate additional road or air transfers, or even a Maun overnight (as departure for the first camp/lodge will already have taken place), subject to extra cost. Your departure flight from Livingstone, Zambia must be booked from midday onwards. Please ensure you have a sufficient amount of US Dollars/Euro in cash of small denominations, as it can be difficult to get any US$ or Euros outside of major centres. We suggest that you allow for US$ 25.00 per day to cover the cost of basic souvenirs (within reason), and more for high valued souvenirs. As all campsites in Botswana are unfenced, it is essential that you bring a good torch as you may encounter wild animals in camp at night. We suggest at least a two D-cell torch/flashlight and a head lamp. You should also bring a spare globe and batteries as they are often unobtainable locally. A good flashlight is not a mini-Maglight or a small penlight flashlight. Wilderness Safaris Explorations does not supply flashlights. Note that a 12V cigarette lighter adaptor (compatible with your camera) will be required on this safari for charging batteries while on game drive or transfer drives at Gomoti Tented Camp and Linyanti Discoverer Camp. Limited charging facilities are also available in the main area at these two camps. The camps have 12V electricity only. Spare batteries are essential (we recommend that you bring three spare batteries) and an image storage device of some sort is recommended. Make certain you have enough card storage – most people take more photographs than expected. Tipping is not compulsory. If, however, you would like to tip because you have received good service, we have enclosed a brief guideline to assist you. You may wish to add a nominal amount ranging between US$ 10.00 to US$ 30.00 per day for incidentals (subject to personal budget choice) – i.e. if additional activities are booked once on your journey, if travel arrangements change for any reason, in acknowledgement of good service received in another area, etc. We would like to emphasise that tipping is definitely not a requirement and should be undertaken only by choice, dependent on the service received. • All personal purchases, including curios, premium brand liquors, telephone calls, etc.